Dr Jengo's World: Marvel Heroes Diary: Feb 6 2014 - How many more? Many Many More! Marvel Heroes Diary: Feb 6 2014 - How many more? Many Many More! How many more? Many Many More! Today's title is a memory of my National Service days.. Possibly due to Reservist coming next week..
As new recruits, we are made to push-ups as exercise/punishments.. and this is how it goes.. Us: (Get into push-up positions) Permission to continue, (Insert rank of Instructor)?! Us: 8 more, (Insert rank of Instructor)! Instructor: 8, your head! Back to 1! Down! So what has this got to do with today's post? Well.. it feels the same with collecting Odin Marks in Marvel Heroes! Having acquired a Legendary item for Deadpool and now almost got another 300 Odin Marks for Colossus' Legendary Item, I somehow forgot I will need another 400 Odin Marks for each hero to bless all 4 of their artifacts. That's another 700 Odin Marks for just 1 hero to reach his maximum potential.. and just over 800 to go if I'm gonna max Deadpool and Colossus.. and I haven't even started on my 2 favourites, Gambit and Ghost Rider..
Looks like I'm gonna be farming Legendary Quests till the cows come home.. (No, I'm not talking about those from the Bovine Sector). With the boost, I found the last 2 uniques Colossus was missing.. I was really hoping for this to buff up my Colossus' damage. While his surviving capability wasn't too bad, he didn't seem to be doing enough damage in the later levels of X-Defense. This one definitely changes things. Frenzy attack really helps with his attack speed. However, his '+ to skills' has me re-thinking my build. 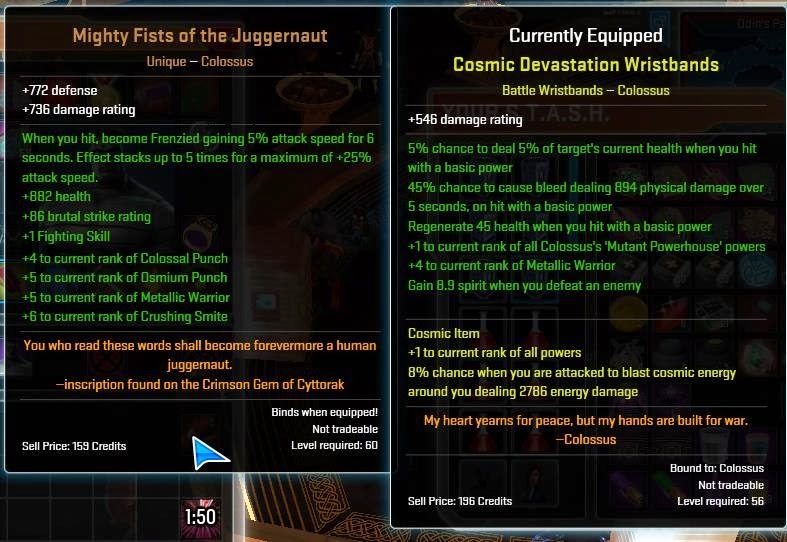 I was using Reeling Punch (Left Mouse Button) and Crushing Smite (RMB) and till now, I thought my build was finalised.. but with this adding so much into Osmium Punch and Colossal Punch, might have to test the damage again. Thankfully, I have plenty of spare Retcon Devices for that. 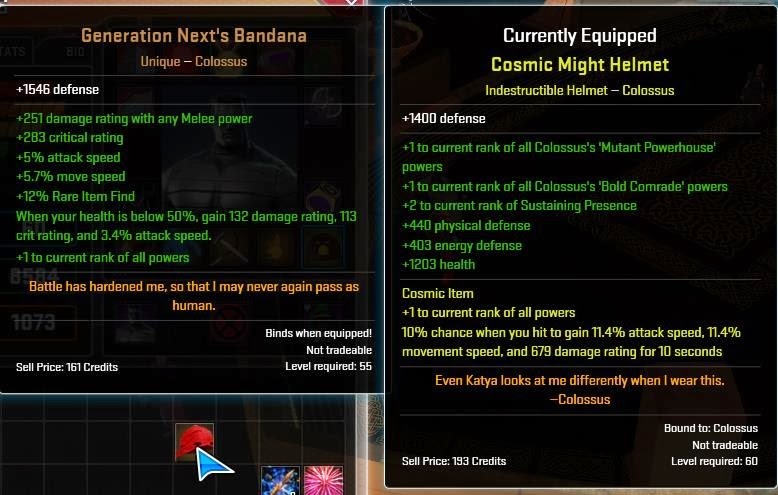 and the last piece making it 5/5 uniques for Colossus..
To be honest, I was quite disappointed in this because of the only "+1 to all powers". I was thinking it would be more than that, to negate the extra "+1"s in the cosmic helmet. Less hp and Less defense as well.. Initially, I didn't even use it.. But after giving it a try, I'm not going back. His damage is really much better now and feels like a real fighter now. He's slightly weaker now so I might use some of the blessings to beef him up but I'm really enjoying seeing him plow through multiple enemies faster than before. First hero to get uniques for all 5 slots. I started level-ing up Colossus to level 60 because I needed a Level 60 Character until I finish prestiging Deadpool all the way, but I really enjoy playing Colossus at the moment. After getting all 5 uniques, he has become the character that I envisioned him to be. Much can be improved and he will only get stronger with the Legendary Item and Blessings. 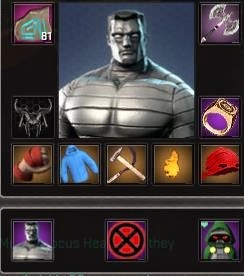 I plan to do a post on my Colossus build in a couple of days, once I test him out again and make my final decision on his 2 punches. Gotta finish the story missions for the extra power points too and then do 1 final re-spec.